Amazon.com description: Product Description: A true cornucopia, The New Oxford Book of Food Plants overflows with information and is packed with beautiful, hand-painted illustrations of the worlds food plants. In an oversized format with alternating full-page color plates, readers will find a feast of facts about cereals, sugar crops, oil seeds, nuts, legumes, fruits, vegetables, spices, herbs, sea-weeds, mushrooms, wild food plants, and much more. This new edition is fully updated with the latest nutritional research, as well as beautiful new illustrations and descriptions of many exotic edible plants that have only recently found their way into our markets and onto our kitchen tables. This is the most comprehensiveand most appealing reference book available on the many edible plants we grow in our gardens, buy in our shops, and eat with great relish. For example, readers will find authoritative coverage of fruit worldwide, both the varieties we commonly find at our local food stand (apples, oranges, strawberries, kiwi, bananas), and some we do not ordinarily see (mangosteen, manzanilla, marang, tamarind, or whortleberry). Entries typically discuss the source and history of a plant, how it is prepared for market, and how it is used as food. And in addition to covering everything from seaweeds to tropical root crops, the editor has included a glossary of botanical terms, a section on nutrition and health, nutrition tables, a list of recommended readings, and an index. 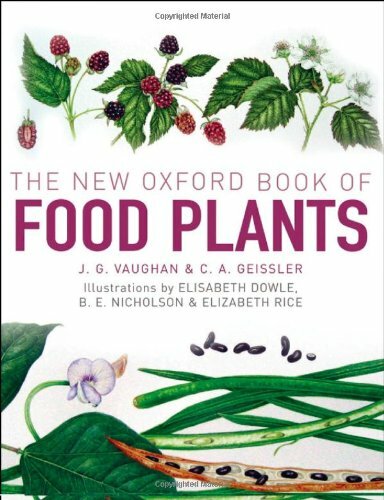 With marvelous illustrations and a wealth of nutritional, historical, and other information, The New Oxford Book of Food Plants belongs on the shelf of everyone who loves to garden, to cook, and to eat healthily. About: A true cornucopia, The New Oxford Book of Food Plants overflows with information and is packed with beautiful, hand-painted illustrations of the worlds food plants.